NASA's Juno spacecraft captured this image of two staggering storms on Jupiter on Dec. 21, 2018. 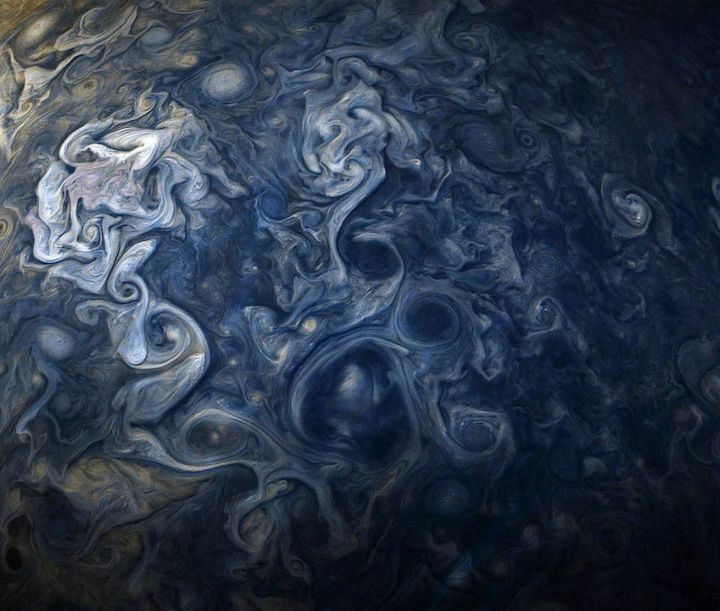 NASA's Juno spacecraft made another pass over Jupiter's surface late last month, and the data is back — including this stunning view of two enormous storms swirling across the gas giant. Accompanying the famous Great Red Spot storm in this image is a second storm nicknamed Oval BA. Unlike its larger russet companion, Oval BAformed under scientists' eyes, when three smaller storms collided in 2000. The visible-light camera on board Juno, called JunoCam, has been able to watch Oval BA change over the course of the mission, with the storm becoming paler since a previous visit nearly a year ago, according to a statement from the Southwest Research Institute, which manages the mission. The image consists of three separate photographs combined and digitally enhanced by volunteer imaging experts here on Earth. JunoCam captured the images when it was between 23,800 miles and 34,500 miles (38,300 and 55,500 kilometers) above Jupiter's clouds. The three photographs were taken during a 10-minute period on Dec. 21, during the spacecraft's 16th close science flyby of Jupiter. Last month's flyby marks the halfway point of Juno's mission, which was carefully designed to cover the entire surface of the gas giant in 32 flybys. The spacecraft will remain at work until July 2021 to complete those orbits. Its next close approach will come on Feb. 12. NASA's Juno spacecraft, which has been orbiting the giant planet Jupiter since summer 2016, is getting dangerously close to challenging other NASA's planetary spacecraft Cassini and Voyager for true iconic status. This color-enhanced image was created by 'citizen scientist' Kevin M. Gill image using data from the spacecraft's JunoCam imager. It was taken on Feb. 12, 2019, as the spacecraft performed its 18th close flyby of the gas giant planet. NASA says that Juno was about 8,000 miles (13,000 kilometers) from the planet's cloud tops when it snapped the photo. NASA is making the raw images from JunoCam available online to anyone who wants to look at them, or like Gill, process them. The latest collection of raw images is from what NASA calls Juno's 'Perijove 18'. A perijove is essentially a close flyby of Jupiter. Juno is in a big polar orbit of the giant planet, and every 53 days it passes just 3,000 miles shy of Jupiter’s cloud tops. That's when it's taking all of its photos, so expect a 'data dump' every couple of months. Juno's mission was replanned last June after concerns over valves on its fule system. Either way, Juno will crash into Jupiter in July 2021. NASA's Juno spacecraft captured this image of Jupiter at 12:20 p.m. EST on Feb. 12. 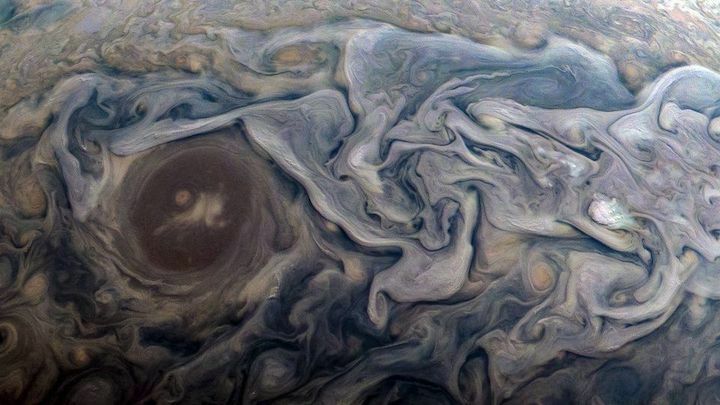 An image captured by NASA's Jupiter spacecraft paints a stunning picture of the planet's swirling clouds. 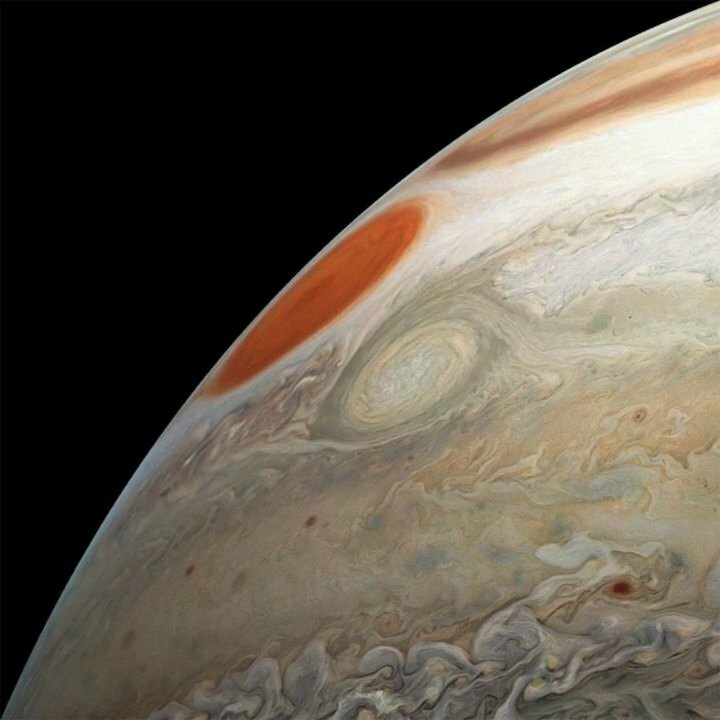 The image, color-enhanced by software engineer Kevin M. Gill, was created using data from the spacecraft's JunoCam imager. The view is of a jet stream region named "Jet N6" at 12:20 p.m. EST on Feb. 12. At the time, NASA reports Juno was about 8,000 miles from the planet's cloud tops. On Twitter, people compared the image to famous artists including Claude Monet and Jack Pollock paintings. Several users asked, "Van Gogh is that you?" This isn't the first time we've seen an artful photo of the planet. 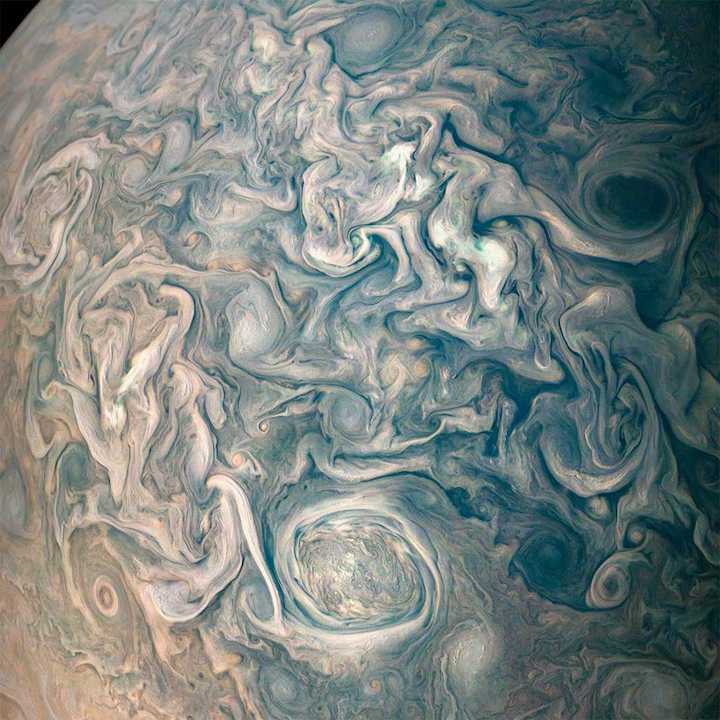 In June, NASA released an image of the Jupiter's "chaotic and turbulent" clouds, with swirling formations and several vortices in the giant planet's northern hemisphere. An image captured by NASA's Juno spacecraft features swirling cloud formations on Jupiter.